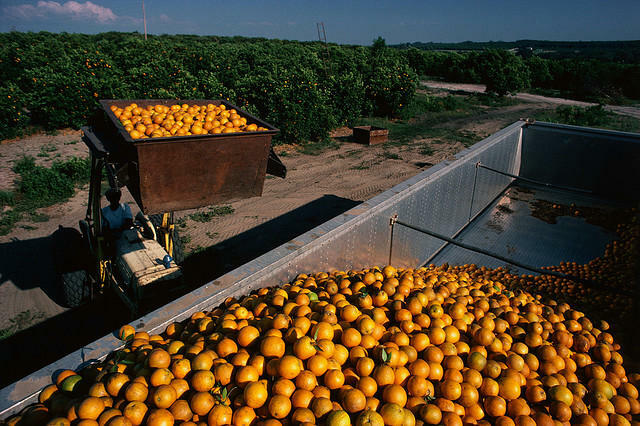 Florida is the largest citrus producer in the U.S. and the second largest producer of orange juice in the world. The industry has a $9 billion a year economic impact on the state accounting for about 76,000 jobs. Not long ago, citrus groves covered about 800,000 acres of land in Florida. Today, that’s down to just over 400,000 acres due in large part to the devastating impacts of citrus diseases like greening. The disease, which originated in Southern China, was first discovered in South Florida in 2005 and has since become endemic throughout the state’s citrus producing regions. This week, just as the U.S. Department of Agriculture reduced its citrus harvest estimate for the current season, Florida Agriculture Commissioner Adam Putman announced he’s calling on lawmakers to increase funding to fight greening and secure the industry’s future. Meanwhile the Fort Myers-based Alico, Inc. announced last month it’s buying three citrus operations in central Florida for $363 million dollars making the company the largest citrus producer in the U.S. We’ll explore the status of Florida’s current citrus crop, the value of the state’s citrus industry and ongoing efforts to develop new strategies to combat greening. Clayton Wilson, CEO of Alico, Inc.